6 Stories from the 7 Continents: Israel and Iran - saber rattling or sobering end moves? Israel and Iran - saber rattling or sobering end moves? 3) Former French Foreign Minister Bernard Kouchner's comment to the effect that if the West does not take the issue of Iran's nuclear ambitions seriously, the default trajectory inevitably heads towards war. 4) Can one imagine a series of statements by the Iranian leadership more inflammatory than those offered? The story of course, is that, according to one AP article today, "for the first time in nearly two decades of escalating tensions over Iran's nuclear program, world leaders are genuinely concerned that an Israeli military attack on the Islamic Republic could be imminent — an action that many fear might trigger a wider war, terrorism and global economic havoc. Israel with a population of 7.6 million on a landbase of just under 8,000 square miles, and Iran with a population of nearly 78 million, on 636,000 square miles. High-level foreign dignitaries, including the U.N. chief and the head of the American military, have stopped in Israel in recent weeks, urging leaders to give the diplomatic process more time to work. But U.S. Defense Secretary Leon Panetta has reportedly concluded that an Israeli attack on Iran is likely in the coming months. Despite harsh economic sanctions and international pressure, Iran is refusing to abandon its nuclear program, which it insists is purely civilian, and threatening Israel and the West. It's beginning to cause jitters in world capitals and financial markets." Story line 1 - Israel, after fighting at least four major wars with its Arab neighbors, and having been "born" out of the holocaust aftermath, has no illusions about security coming from any other nation's assurances than its own military abilities. Israel, through a string of national Prime Ministers from a spectrum of conservative to liberal ideologies, has never hesitated to unilaterally strike at direct threats. In June, 1981 Israeli warplanes struck Iraq's Osirak nuclear facility near Baghdad. In September, 2007, Israel bombed a suspected nuclear reactor in Syria. This time, the stakes are higher. Iran has long pursued nuclear capability, purportedly for civilian power, but the consensus is that a nuclear weapons component is drawing close. The challenge for Israel's capable air force is that the distance to Iran is much further than other actions, Iran's defense capabilities more daunting, or at least prepared, and that the scattered nature of the facilities make a comprehensive strike a larger and more complicated action. Story line 2 - US President George W Bush famously called three countries (Iraq, Iran, and North Korea) an "axis of evil" soon after the Al Qaeda September 11, 2001 attack. While politically discredited in 2003 after being unable to locate weapons of mass destruction in the by-then occupied Iraq, his characterization remains. 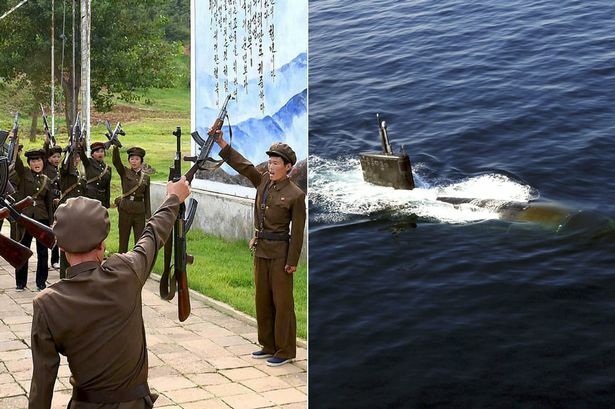 And two of the wild cards on the international stage are indeed, North Korea (with the capability of inflicting major damage regionally on South Korea or Japan), and Iran (with its belligerent stance in the oil rich Middle East, supporting known terrorist groups such as Hezbollah, Hamas, as well as Syria's odious Bashir Assad). As one commentator once observed, "some things are true, even if George Bush believes them ..."
Iranian President Mahmoud Ahmadinejad stands next to the Iranian-made new-generation long-range cruise missile during the national Defense Industry Day ceremony in Tehran in August 2011. Story line 3 - The respected Bernard Kouchner, founder of Doctors without Borders, and a recent foreign minister for France, once lamented the lack of serious and unified effort to prevent Iran from gaining nuclear weapons. He stated that if the West would not do everything within its power to prevent this development, then the trajectory would end up at what precisely everyone was hoping to avoid. At this point, it should be noted that a straightforward Israeli strike against Iran's nuclear facilities could very likely spread in economic terms to a major world crisis. Iran has repeated thundered that if attacked, it would close the Straits of Hormuz to the ongoing flow of oil to the world's nations.. And every country would be confronted with the practicalities of whose side would they take, and in what form. * Saudi Arabia - enemy of Israel, rival to Iran. Would it actively resist an overflight of Israeli jets on the way to bomb Iran? Would it actively resist a retaliatory response from Iran back at Israel? * Germany - what practical measures of support would it provide to Israel under attack. * Egypt, Turkey, Iraq - sit on the sidelines? * The US, France, UK - regardless of position's taken to defend Israel, what steps would be needed to keep oil flowing from the region. The numerous nuclear facilities in Iran would mean a complicated and large Israeli strike. An immediate defense of the oil flowing from the Persian Gulf would fall into the lap of the US Navy. Story line 4 - Over the past several years, Iranian President Ahmadinejad could not deliver more bellicose and inflammatory statements than those he repeatedly spews, "there was no holocaust," "Israel will be wiped from the face of the earth, God willing," etc. From the UK Guardian, we also read that in the past few days, Iran's Ayatollah Ali Khamenei threatened to attack Israel in retaliation for western sanctions, and in a two-hour televised speech, he said: "From now on, in any place, if any nation or any group confronts the Zionist regime, we will endorse and we will help." He referred to Israel as a "cancerous tumour that should be cut and will be cut." 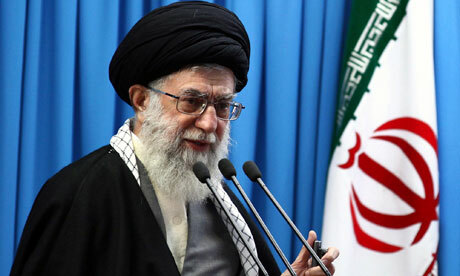 Iran's Supreme Leader, the Ayatollah Ali Khamenei matches the rhetoric of his President, calling Israel a "cancerous tumour that should be cut and will be cut." Hossein Salami, the deputy head of Iran's elite Revolutionary Guards, told the semi-official Fars news agency. "Any spot used by the enemy for hostile operations against Iran will be subjected to retaliatory aggression by our armed forces ..."
So there we have it, on Superbowl Sunday, 2012, in the US. A sobering swirl of rhetoric and trajectories are once again building in the Middle East. Not mentioned in this post is the distinction between leadership and the common person. In Israel, a wide variety of viewpoints and emotions are evident, though a threat to the very existence of the country gives everyone pause. In Iran, we in the West are only dimly aware of the resolve of much of the nation's youth and dissenters who had called for a Green Revolution in 2009; a serious and courageous act of defiance that received only very timid words of support from the West. Iran's leaders, in contrast, are harsh and inflexible ideologues judging by the vast majority of actions and speeches in the past 30 years. So it seems as always, the fate of the common people in so many countries will be impacted by the egos, calculations (and miscalculations) of their leaders. Returning to the first sentences in this blog, will Western leaders of various nation's and institutions be able to prevail on Israel's leadership to postpone an attack in order to give more time to diplomacy and sanctions. Or is this more hand-wringing that places the hardest question back in the hands of the Israeli's. US Defense Secretary Leon Panetta's strangely fatalistic observation that Israel is likely to strike Iran in the coming months, caught world attention. One assumes it was a deliberately chosen statement, designed to send messages to other world leaders, or distance the US from any Israeli action - one doesn't know. This is indeed a time to pray for those numerous world leaders facing a narrowing time-frame for diplomatic progress.